Once roamed by some of the world's largest dinosaurs, Alberta's Drumheller is now a popular tourist destination. A road trip through Canadian prairies will turn up some truly fascinating and unique towns. From a town that honours the Starship Enterprise to the world’s largest curling rock, there’s no shortage of quirky places to make the trip worthwhile. Imagine it, you show up in Canada to begin your holiday and you stumble across a small town so cool – and so quirky – you’re wondering why you didn’t know about it when you were initially planning your trip. Well guess what? There’s a heap of places just like that in the Canadian Prairies, so we’ve researched them all and put them into a list, so that you never have to wish you knew about them when you were planning your Canada trip. The town of Vulcan is a must-visit place for Star Trek fans, there’s even a USS Enterprise monument in town (photo: Canoe1967 Wikicommons). This is a town in the south of the province that bills itself as the Star Trek Capital of Canada. For the uninitiated, Vulcan is the home planet of Mr Spock in the Star Trek TV and movie series. You’ll find a large likeness of the USS Enterprise starship in town. When he was alive, the fellow who played Spock in the early TV shows and movies (Leonard Nimoy) would occasionally show up for Star Trek conventions. Each year Vulcan hosts the annual Vulcan Tinman Triathlon, which takes place at the beginning of June. The event began in 1990 and attracts nearly 1000 participants. They are classes for adults of all ages and capabilities and teams for the kids, too. The Town of Vulcan is located between the cities of Calgary and Lethbridge on Highway 23. Performance tents set up for the annual Shakespeare festival in Saskatoon, Saskatchewan. The annual Shakespeare on the Saskatchewan festival is a great way to enjoy live theatre on the banks of the South Saskatchewan River. I saw a great version of Taming of the Shrew a few years ago, updated to a 1960s setting. It was founded in 1985 and runs over summer each year. The very first production in 1985 was ‘A Midsummer Night’s Dream’, then between 1985-1991, the festival saw the production of seven of Shakespeare’s plays plus a remounted national tour – a landmark bilingual production of Romeo & Juliette. These productions celebrated the festival atmosphere and challenged approaches to Shakespeare. Basically, the theme stuck. The food is exceptional at Ayden Kitchen and Bar. Riversdale is an up-and-coming neighbourhood with great galleries, coffee shops and more. Saskatoon is the largest city in the province of Saskatchewan. It straddles a bend in the South Saskatchewan River and is located along the Trans-Canada Yellowhead Highway. The town of Flin Flon in Manitoba is named after a fictional book character called Flintabbaty Flonatin (photo: Flin Flon Heritage Project). This is an old mining town in northern Manitoba named after a fictional book character named Flintabbaty Flonatin. Bakers Narrows Provincial Park is a wonderful spot for camping and fishing. The Northern Visual Arts Centre is a fun place for kids to get creative. It is considered one of Canada’s most unique communities. With an approximate population of only 4,991 people, Flin Flon still boasts quite a bit of activity for a small town. They have a tourist park and campground, as well as fine restaurants, night spots, scenic trails and lakes. It is located on a correction line in the boundary of Manitoba and Saskatchewan, with the majority of the city located within Manitoba. Water fun at Castle Falls, Pincher Creek just south of Alberta (photo: Travel Alberta). The town is located in the south of Alberta, close to both the low Crowsnest Pass route to British Columbia and a short drive from majestic Waterton Lakes National Park. The town has hosted several Cowboy Poetry Festivals, with readings, live musical performances and more. The way the town was named is as unique as the place itself. It was named in 1868 when a group of prospectors lost a pincer in the small creek at this location. These pincers would have been used as a mechanism for trimming the feet of the horses and were considered valuable. In 1874, the North-West Mounted Police came to southern Alberta. One of them discovered the rusting tools in the creek, and they named the area Pincher Creek. Where is Pincher Creek, Alberta? Pincher Creek is located immediately east of the Canadian Rockies, 101 km west of Lethbridge and 210 km south of Calgary. Mac the Moose at Moose Jaw in Saskatchewan (photo: Matt Boulton Flickr). The town is famous as a centre for rum-runners and criminals during Prohibition, and they say there are tunnels in town used by infamous Chicago criminal Al Capone. Take a visit to Mac the Moose for a great Instagram shot, then hit Manitou Springs Resort and Spa to float in Canada’s largest indoor mineral pool. As if that wasn’t enough, CFB Moose Jaw is a NATO flight training school, and is the official home of the Snowbirds, Canada’s military aerobatic air show flight demonstration team. Moose Jaw also has a casino well worth visiting but mostly, it’s all about the giant Moose, Mac. Where is Moose Jaw, Saskatchewan? Moosa Jaw lies on the Moose Jaw River in the south-central part of Saskatchewan, it’s situated on the Trans-Canada Highway, west of Regina. The town of Legal in Alberta is home to many French Murals (photo: Town of Legal). Established in 1894 as a Francophone community, this is one of the French language centres in a province not exactly known for bilingualism. There’s no giant statue of the Eiffel Tower or many baguettes, but you will find some three dozen murals in this small, central Alberta town, making it the self-proclaimed and remarkably specialised French Mural Capital of the World on a per capita basis. Legal is located with Sturgeon County. It’s approximately 2.4 km east of Highway 2 on Highway 651, some 42 km north of Edmonton. The Pas claims to have one of the world’s ‘true blue lakes’, located in Manitoba, Canada. This is simply a frontier town with some cool bits, including funky signs and one of the province’s oldest settlements. They claim to have one of three of the world’s ‘true blue lakes’. It was a traditional meeting place for natives and French and English fur traders. The main employer in The Pas is a paper and lumber mill operated by Canadian Kraft Papers. The town also claims to have one of world’s ‘true blue lakes’ – and they’re quite a sight to see! Where is The Pas, Manitoba? The Pas, Manitoba is located at the confluence of the Pasquia River and the Saskatchewan River. 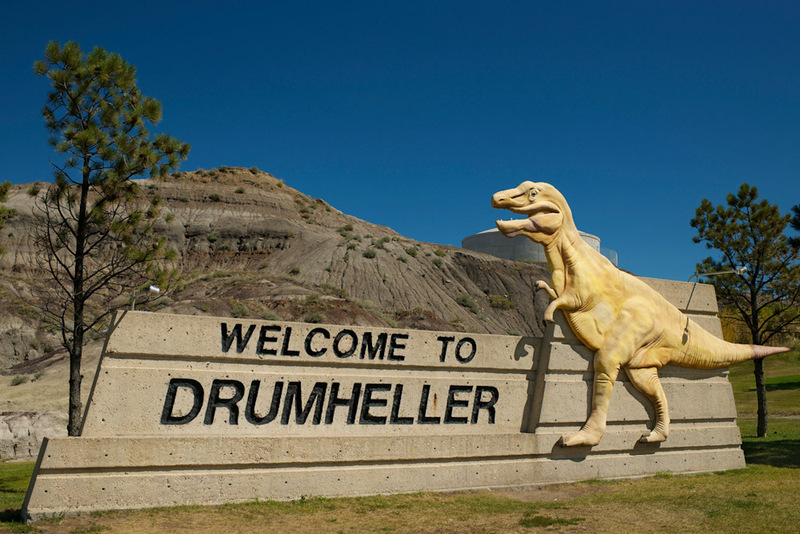 Once roamed by some of the world’s largest dinosaurs, Alberta’s Drumheller is now a popular tourist destination. Alberta long ago was home to some of the world’s largest dinosaurs. Their bones now litter the area, which is home to the Royal Tyrrell Museum of Palaeontology. It’s both a tourist attraction and a world-class research spot that families will love, due to the high number of fossils they display. Check out the ‘world’s largest dinosaur’ out front. Nearby, Horseshoe Canyon is a lovely rafting spot. Also close by, the Atlas Coal Mine National Historic Site explores the Drumheller Valley’s coal-mining heritage. 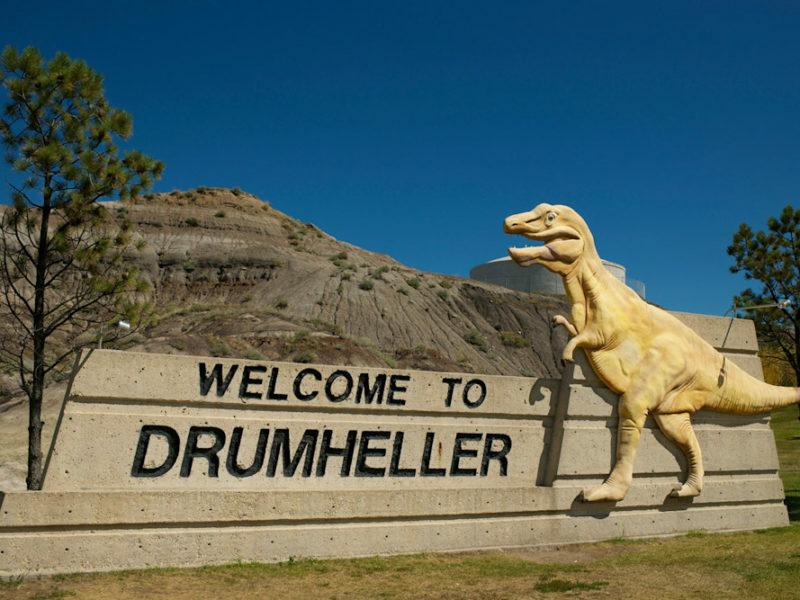 Drumheller is a town northeast of Calgary, in Alberta, Canada. What’s 2.1 metres high and 4.2 metres wide? why, the worlds largest curling rock, it’s located in the town of Arborg, Canada (photo: Travel Alberta). Canadians are into the sport of curling, played with round ‘rocks’ on sheets of ice, which aren’t hard to find during a Canadian winter. The town of Arborg proudly displays what it calls the world’s largest curling rock, a monster stone that’s 2.1 metres high and 4.2 metres wide. There’s even a recreation complex boasting a number of facilities, including a skating arena, community hall, a ball park – and of course, a curling rink. Arborg is a town located in the Rural Municipality of Bifrost in Manitoba’s Interlake Region, 103 kilometres north of Winnipeg. Looking for more interesting places to visit in Canada?